Autumn Gardens is a small team of professional landscapers, offering a full range of skills to meet all your hard and soft landscaping requirement. The company is based in St Neots, servicing Cambridgeshire, Hertfordshire and Bedfordshire, working in Cambridge, Cambourne, Stevenage, Huntingdon, Peterborough, Bedford and Sandy. 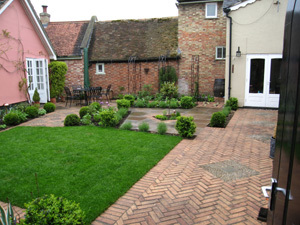 We offer a complete landscaping service from working with you on the design of your dream garden, providing brochures and advising on the variety of materials available for patio’s, driveways, paths and walls to support your design. Customer references are available, along with our portfolio of successful projects. Autumn Gardens have developed a reputation for reliability, quality and customer care resulting in our appointment to Marshall’s Register of Approved Landscape Contractors and Driveway Installers. This enables us to offer a 10-year guarantee for Marshall’s products used and 5-years labour guarantee on our work, providing the assurance and peace of mind that an insurance backed leading manufacture’s guarantee can offer.